COOPERSTOWN-A sukkah has been constructed at the National Baseball Hall of Fame by Rabbi Israel Rubin of the Maimonides Hebrew Day School. 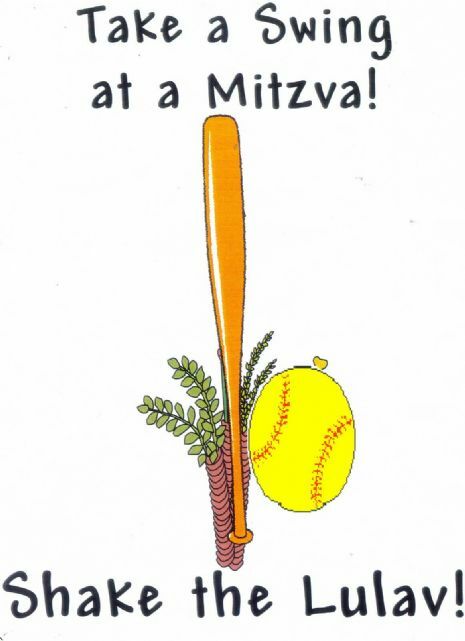 Maimonides High students designed a baseball sukkah logo sticker inscribed "Mitzva Grand Slam." The students decorated the "Sukkah of Fame" with hanging baseballs along with the traditional fruit and vegetables. Trivia about famous Jewish baseball heroes such as Hank Greenberg and Sandy Koufax, who declined to play on Yom Kippur, add to the decor. ALBANY, NY (AP) - Jewish baseball fans anxious to see the ball Mark McGwire blasted into the record books won't have to wait until after Succot to make a trip to The National Baseball Hall of Fame. A Hebrew school in the Albany area is constructing a Succa at the Cooperstown institution so the devout can hit the road and still observe tradition. Traveling can be difficult during the seven-day holiday, says Rabbi Israel Rubin of the Maimonides Hebrew Day School in Albany. Jewish law requires that all meals be eaten inside a Succa . "It's a holiday and people " want to have fun," he says. Rubin says the Hall of Fame's location in Cooperstown is ideal because many Jewish people criss cross the state on iheir way to and from Montreal, New York, Boston and Toronto. The "Succa of Fame," which will be erected at Cooperstown, is going to be aboul 10 square feet in size. Students from Ihe school will decorate the structure with traditional fruit, along with less traditional baseballs. Pictures of famous Jewish baseball players like Sandy Koutax and Hank Greenberg will adorn the walls. And there should be plenty of extra fans at the Hall of Fame to take advantage of the Succa. ...and then there was a Sukkah! This year, for the first time ever, Chabad of the Capital District, built a beautiful Sukkah right in the parking lot of the Colonie Price Chopper. In gratitude to G‑d for protecting them and providing for them during that time in such a desolate area.To celebrate this great kindness of G‑d, during the eight day holiday of Sukkos, a Sukkah is built adjacent to the house and all meals are eaten in it, just as the Jews in the desert "ate" outside in the elements and were protected so too now, we eat outdoors in the "elements" and are protected. 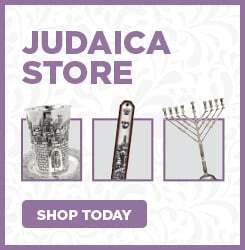 What is a Sukkah? It is a temporary "booth" made of wood and covered with evergreen branches. The Succah is placed directly under the sky with no covering allowed save for the branches. Throughout the week of the holiday, explaining the holiday to those who inquired and making all the visitors feel at home. The Colonie Supercenter has become a maj or stop for many Jewish customers. They travel to us from as far away as Montreal, Canada and New York City . As a result, over 300 people stopped in to visit the Sukkah during the holiday. 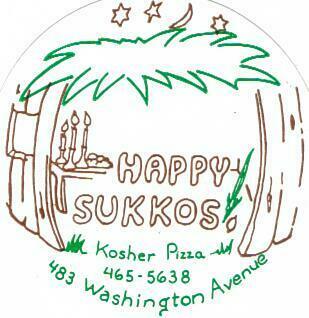 They were all very grateful for having both the Kosher Store in which" to purchase their kosher food and a Sukkah outside in which to eat in. Once again, we were a true Kosher "oasis" on a very long trip! The road from New York City to Montreal is littered with Dunkin' Donuts, Nathan's Hot Dogs and Burger King, but for Jews observing Sukkot, where they eat matters as much as what they eat. A harvest celebration that commemorates how God protected the Jews through 40 years of wandering in the desert, Sukkot began at sunset last Friday and continues through Saturday. During this eight-day festival, the faithful try to eat all their meals, whether at home or away, in a sukkah, a small hut with a roof made of natural materials such as bamboo matting and evergreen boughs. Eating in a sukkah is an important tradition, as the roughly built shelter symbolizes the temporary dwellings Jews used for living quarters after the Exodus. Some Jews, during this time of visiting family and friends will refuse to eat except in a sukkah. According to The Union of Orthodox Jewish Congregations of America Web site, during Sukkot, Jews "leave the protection; and security of our houses and put ourselves underlie direct protection of God." Not having a sukkah available for meals can make the eight-hour drive from Montreal to the city seem like an eternity. Bu fortunately, officials at Chabad a Hasidic movement, and Price Chopper worked together to create a sukkah in the parking lot Price Chopper on Central Avenue in Colonie. Made of fiberboard walls with a bamboo mat and fir bough ceiling, the Price Chopper sukkah is about 16 feet wide and 20 feet deep. The inside is decorated with plastic fruit and crepe paper leaves, posters from kosher food companies, and a charity box. Visitors to the sukkah need to bring food or are encouraged to shop at the Price Chopper, which has an extensive kosher department. Just two miles from the Northway a 24 hours a day, the sukkah has become a mecca for the devout. "It's become quite a famous stop," said Yakov Werde of Morristown, N.J. A father of 10, Werde had brought his four youngest, all boys, on a short vacation to Howe Caverns. The group gathered in the sukkah Monday for evening prayers and dinner. "A kosher magazine did a big story on it in their last issue, and people talk about it all the time," Werde said. "The Thruway and the Northway, between New York City and Montreal, is probably the most traveled route in the country for Jewish people," says Yakov Yarmove, Price Chopper's kosher specialist. "Thanks for preventing my husband's headache," wrote a Mrs. Junger from Brooklyn. "If not for your sukkah my father wouldn't be able to have a decent meal," wrote someone named Agishtein of Lakewood, NJ. And in the practiced printing of a child's hand, Shneur Minkowitz of Montreal wrote, "i LOVE EATENG." But it's not only tourists who celebrate at the Price Chopper. Area Jews and non-Jews alike signed last year's log. a hug or an extended hand. We need to learn about one another and their beautiful celebrations,” signed M.J. Walters of Colonie. On Monday, me first day this year's sukkah was complete, it received odd looks from some shoppers, sneers from others and became a collection point for grocery carts. Some of the curious stopped long enough to read an explanatory message posted by Yarmove. But the structure becomes an educational site for people of other religions as well. Lori Hammond of Colonie, a Roman Catholic, stopped by with her children, Scott and Rose, to ask the proper pronunciation of the word "Sukkot." (It's Su-COAT). "They're talking about it in religion class and the way they pronounce it can be rather uncomplimentary," said Hammond. "I wanted to make sure we got it right." Nechama Friedman, 10, of Monsey, which is about two hours south of Albany in Rockland County, wants to get it right, too. Nechama has arrived at the sukkah with her parents and six brothers and sisters. She can't wait to say the blessing, shake the Arba Minim and have dinner. Although only the men are required to eat in the sukkah by Jewish law, women may participate. The Friedman women do joyfully. The family, which drove up from Monsey for a day at the Capitol and State Museum, would have used their portable sukkah if they hadn't read about the Price Chopper sukkah. "It's only a refrigerator box that we cut open," says Lynn Friedman, Nechama's mother. "We put bamboo mat over it and crouch inside." "We even decorated the inside of it," says Ahuva Friedman, the l9-year-old daughter, proudly. Before they dine, the men in die-family say the evening prayers and the women, who have not fulfilled the commandment to "rejoice before the Lord" for the day, say that-blessing and shake the Arba Minim. The Arba Minim is a collection of three carefully selected boughs of palm, myrtle and willow and a piece of the citron fruit. Each component represents a body pan (spine, eye, lips and heart) and a different type of Jew. Together they represent Jewish unity as a people and the parts of the body used to worship God. After Lynn and Ahuva take their turns, Nechama gets her chance. ARBA MINIM is made up of four elements: the etrog citron ; the lulav palm branch; the aravah willow; and the hadas myrtle. The four are bound together and symbolize the heart , spine, lips and eyes, respectively. Having completed the blessing, young Nechama beams.